A lot of space news over the past week or so. 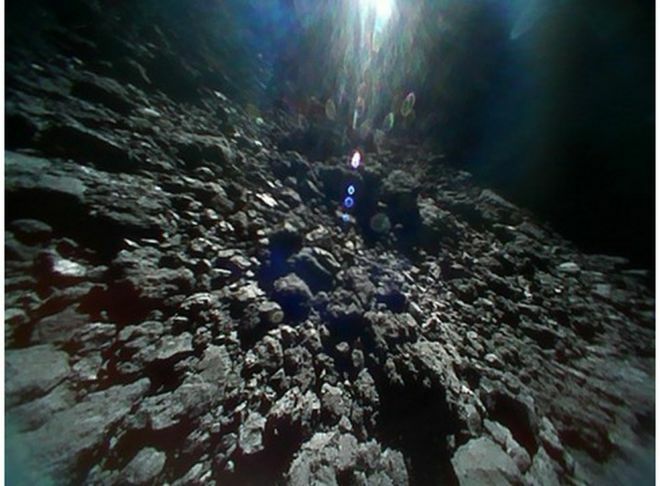 The big news has been the successful touchdown of landers by the Japanese Hayabusa 2 probe, with three out of four now successfully on the asteroid Ryugu. Expect many more to come. These are tiny galaxies - some with just over 1,000 stars - and very faint, hence why they have been hard to detect - and why others might also be out there. I also can't help wondering what sort of view anyone in them might get of the Milky Way. It is possible that these intergalactic interlopers come from the Large Magellanic Cloud, a relatively small galaxy orbiting the Milky Way, or they may originate from a galaxy even further afield. 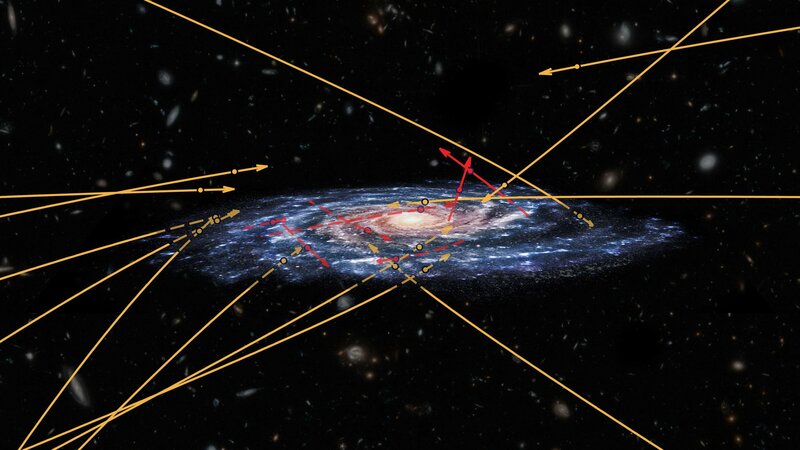 ... An alternative explanation is that the newly identified sprinting stars could be native to our galaxy's halo, accelerated and pushed inwards through interactions with one of the dwarf galaxies that fell towards the Milky Way during its build-up history. 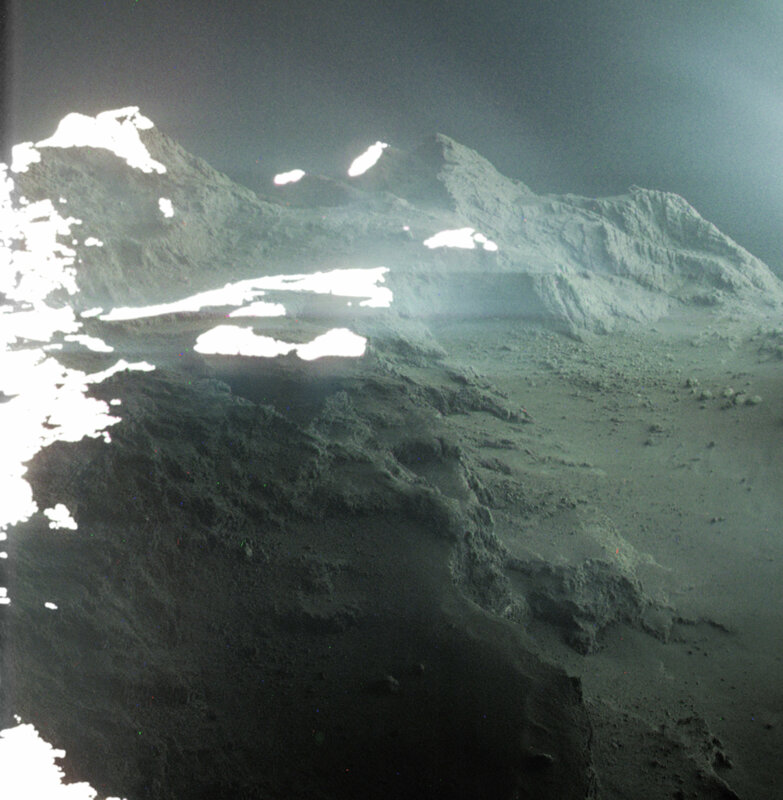 Does bounding around the surface of an asteroid qualify as roving? Space ions bad for guts, soft tissues, organs. I would rather see the tests performed in space. While it may not matter, the particle beams being used to test gut reactions on Earth could be considered to be artificially concentrated compared to what is actually flying around in space. The stuff in space could be the same, have less effects, or more, but I don't think it is the same stuff. It isn't all coming from the same direction. The article says it is difficult to make effective shielding against all the different kinds of radiation. The article says using the current shielding technology, it is difficult to protect astronauts from the adverse effects of heavy ion radiation. Does that mean that the astronauts on the space station are not adequately shielded? Or is it being assumed that space vehicles and other situations won't be as well shielded as the space station is. It appears there is a trade off between capability and the actual weight and structure of the shielding. The effort seems to be directed towards a light weight shielding system that blocks almost everything instead of making something that works. I would suspect the problem is maximized when a person is walking around. Seems like the shield would be more massive than the space suit. Everything would be massive from the shielding which throws the idea of instant lite weight construction models out the window. You need artificial gravity but you also need shielding. Cheap housing on the Moon or Mars would be burrowing under the surface with a lite weight carousel wheel inside the burrow. I wonder if the zooming stars might be indicative of more things not going in the direction we assume them to be traveling in. Maybe there is a lot more movement going in directions we can't detect because of our physical position. Does that mean that the astronauts on the space station are not adequately shielded? I presumed they were experimenting with deep space conditions, as the ISS is still protected by the Van Allen radiation belt. Talk about hard to reproduce shielding. Space ions bad for guts, soft tissues, organs. The issue is the Earth's magnetic field. Charged particles from the Sun get caught in the field and due to the physics of electromagnetism get sent into spiraling paths toward that North and South magnetic poles. That is what causes the Aurora Borealis and Australis. But that means anything orbiting below the Van Allen belts is protected to a significant degree from the solar wind. Long term exposure beyond the van Allen belts would be much more dangerous and require heavier shielding. That is one of the issues for any trip to Mars. The Moon trips were relatively short. .... I wonder if the zooming stars might be indicative of more things not going in the direction we assume them to be traveling in. Maybe there is a lot more movement going in directions we can't detect because of our physical position. Perhaps the gravity of a galaxy attracts lone stars?